The Widethroat W Range has been designed to handle highly viscous materials, such as sludges, slurries, thick non-flowing pastes and de-watered sludge cake with viscosities up to 1,000,000cP. This transfer pump consists of an enlarged rectangular inlet with a screw conveyor to assist the product into the pumping element. 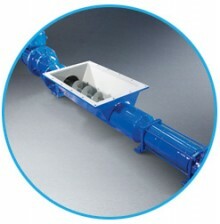 Options are available to modify the inlet with either large diameter augers, integral bridge breakers or both.